My name is Leon. It has been less than 1 day since my last harebrained scheme. 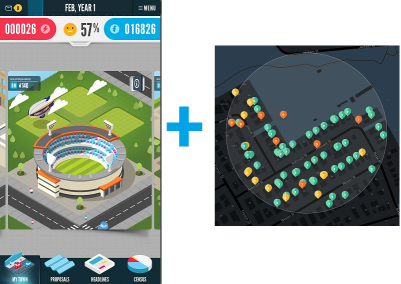 So the Australian Bureau of Statistics* recently put out a sim-city style game on iphone and Android, called 'Run that town' in which you compete for money and klout by approving/rejecting fictional development in familiar suburbs, using real statistics from that suburb. And on the same day as I saw that I took a look at this interesting site, crimemap.info showing where and when real crimes have happened in my home state of Queensland. Right down to the address. So - mashing the two ideas together - I thought, why not make a Drug Wars clone with a local flavour. You choose a starting street, anywhere in Queensland. And on each turn you can run from your current location to any of the adjoining real streets. The criminal behaviour in that street is based on historic crime in that street. (Magnified several thousand times to suit the intense pug-wars style of play). Obviously we take it global as datasets become available, but we market locally. Okay, I've got nothing to present. I didn't implement anything. Yet. I know some people though. This would be riiiight up their alley. You know who you are. * The game was built by millipede possibly with input from Leo Burnett Sydney.